This open-air pavilion that was built in 18th century was used as the Supreme Court in the Royal era. In the Royal era, Klungkung had power in 8 prefectures of Bali. The desks and chairs for the trial is still remained, and there is the detailed ceiling painting by the traditional “Kamasan style.” On the lower part of the painting, there is the picture of a bad person who goes to hell is punished. Ceiling paintings is magnificent. I looked up all the way on the ceiling and my neck got tired. It was quiet around the pond. 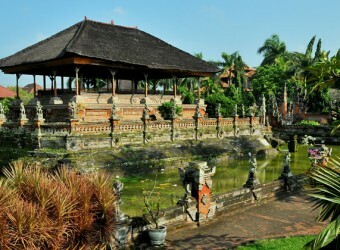 Besides the palace, there is also a museum with collections of objects related to Bali history. This tourist spot is impressive.